The repetitious folding of cranes as a mental discipline in an effort to do good is as satisfying as it is productive. It is a physical representation of your hopes and wishes of support for the recipient. A profound act of kindness. Thousands of people joined together for our “Operation Sandy Hook” initiative through which I collected over 10,000 cranes and crane projects for the new Sandy Hook school.There are many individual and personal stories that come with our “Operation Sandy Hook” initiative, and with the donation of the over 10,000 origami cranes which were folded in 13 countries, then mailed to me in Pennsylvania. Every parcel was carefully packaged, so that no delicate crane or crane project arrived damaged or crumpled. I am getting requests for more descriptive information about the exhibit design and plan, and I am happy to provide more details. First of all, “Folding for Good: Art Meets Science” included a fun interactive component—I invited Carnegie Science visitors to Fold for Good with me and many dear teaching folding friends on Thursday, October 3, and Saturdays October 5, 12, and 19, 2013. We greeted over 750 science center visitors at our post on the third floor in the beautiful Overlook Room. Many of the visitors were first time folders who left behind 234 origami cranes, which I strung into the cascade shown here. 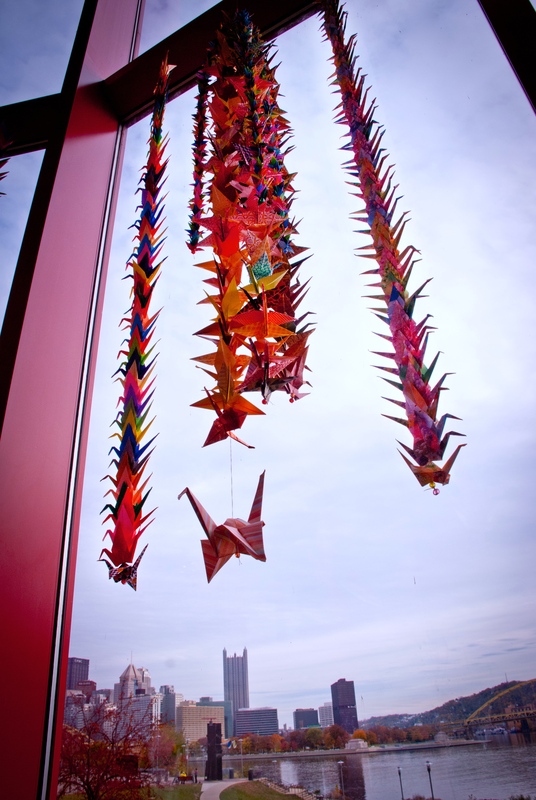 Other volunteers who taught the crane include members of the Japan America Society of Pennsylvania, Origami Club of the University of Pittsburgh, the Origami Club of Pittsburgh and Folding for Good leadership. 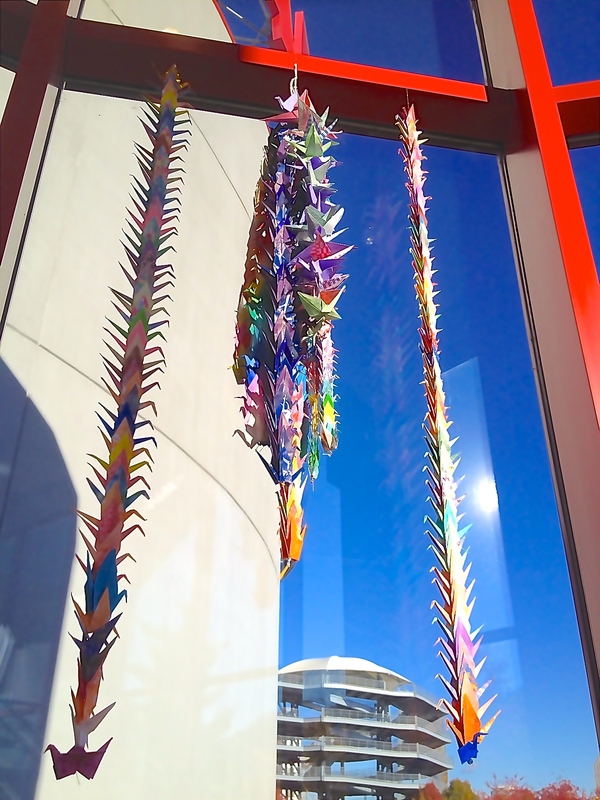 Only 5,050 cranes of the 10,000 cranes collected were included in the exhibit due to space limitations and safety concerns. In the background of the photos is the skyline of the city of Pittsburgh, Pennsylvania. 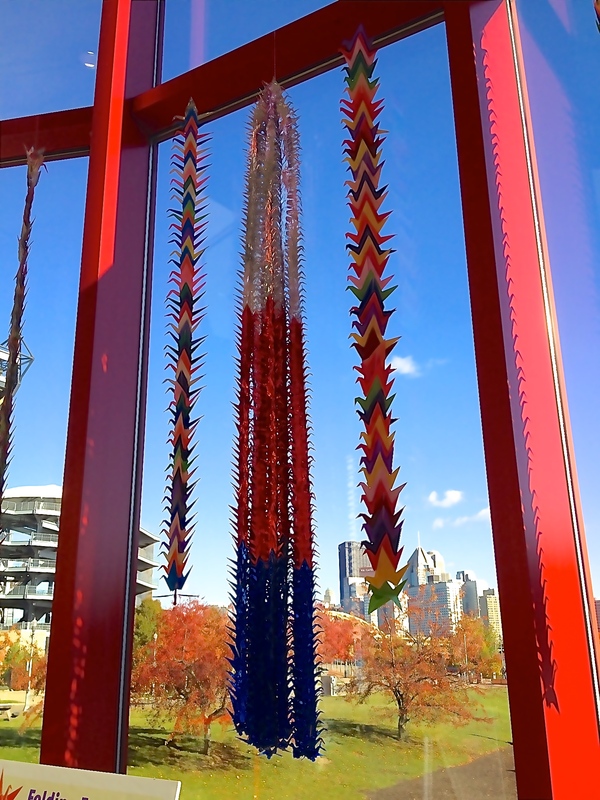 Origami for Africa, Kyoko Kimura, Director, contributed the central cascade, which is comprised of 634 strung cranes with beads. These cranes are multicolored and folded from all types and sizes of paper. It is a colorful tapestry representation of peace. 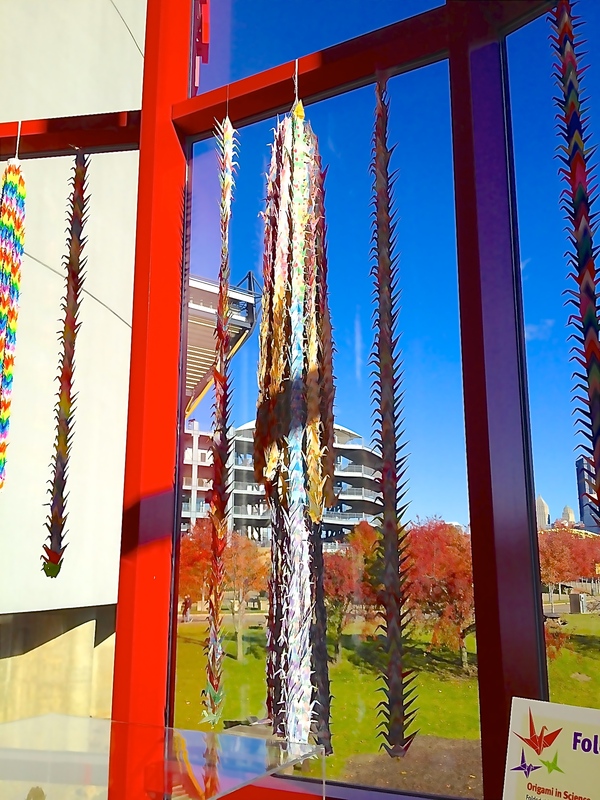 The central senbazuru in Window 2 was folded and strung by Janet Locke of Tochigi, Japan and sent as a gift to her sister, Julie Ash of Olympia, Washington, USA, to commemorate a family event. In turn, it was forwarded by Ms. Ash to us. These 1,000 cranes are perfectly matched and constitute a “senbazuru,” the traditional 1,ooo cranes folded for a single wish. Window 3 features another 1,000 cranes senbazuru folded by Owen Byrne, President Origami Salami Iota, Ridgewood, New York. Owen’s “1001 Crane Army” was received packaged by 100’s and then was strung for the exhibit with assistance from the Origami Club of the University of Pittsburgh. The 1,000 red, silver, and blue metallic cranes centered in Window 4 were folded by Kimi Ego and family, Torrance, California, USA. All were received packaged and sorted by 100’s, and then were strung by me and a few friends. 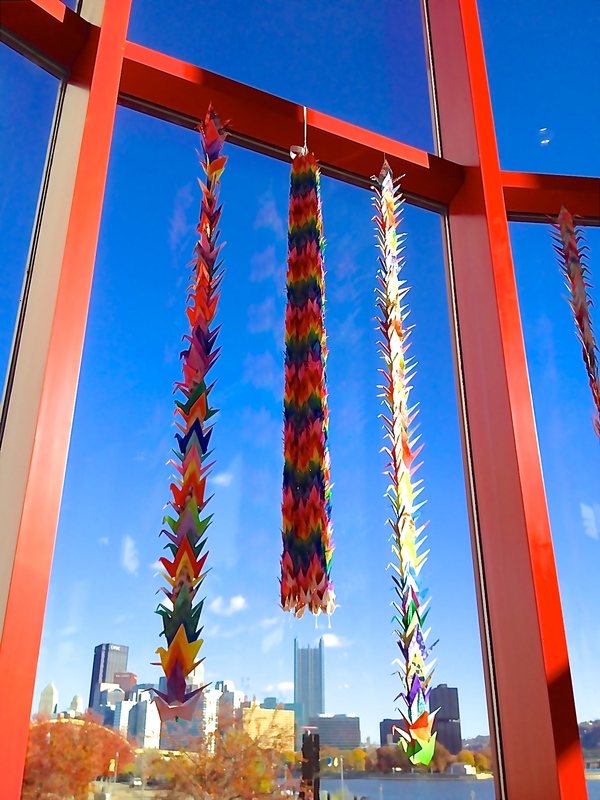 The central cascade of Window 5 represents the crane wishes of hundreds of participants worldwide. A few friends and I strung the center cascade from many sizes of paper and lots of patterns to create a tapestry of color that coordinated with Window 1 from Origami for Africa. The single, oversized crane that dangled from the cascade was folded by Sydney Perrine, President, Origami Salami Kappa and Folding for Good 10, Melbourne, Florida, and was the only window composed in this way. Sydney’s crane appeared to be flying over the “Point,” which is the spot in Pittsburgh marking the convergence of the Allegheny and Monongahela Rivers to form the Ohio River. It is a lovely spot, and made for a striking background. I strung all of the 10, ten foot long strands which flanked the centered cascades. It starts as a slow process, but as you get used to it, it is quite a bit of fun and very relaxing a mental exercise. I added facetted beads to the bottoms of all of the strands to catch the sunshine. 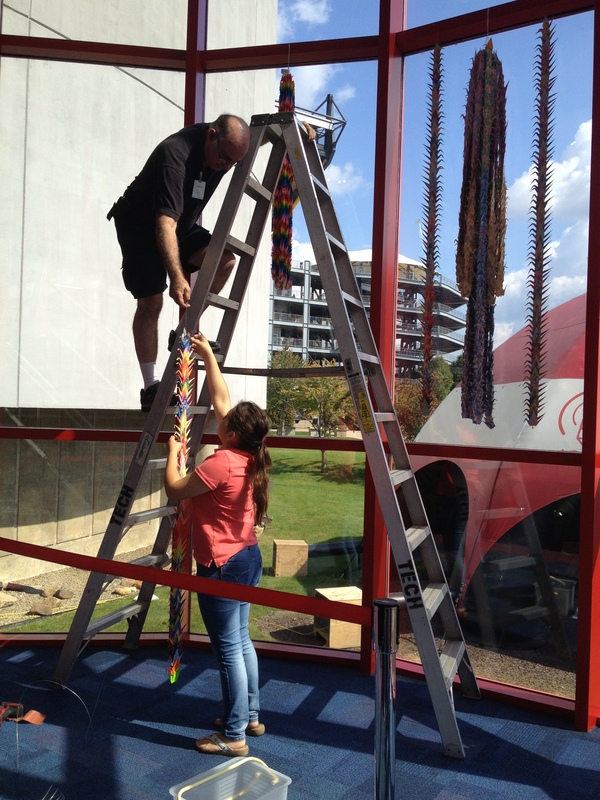 The facilities staff of the Science Center hung all of the crane senbazuru, cascades, and strands. In closing, I am pleased to say that the touching messages written on so many cranes form the text of a photo essay in progress. Operation Sandy Hook became much more than an expression of sympathy at the happenings of the school murders there. It became a multicultural experience that gives everyone everywhere hope in the face of inexplicable tragedy. This entry was posted in Art, Math, Origami, Sandy Hook, Science, STEM and tagged Calista Frederick-Jaskiewicz, Carnegie Science Center, Folding for Good, o, Origami for Africa, Owen Byrne, Peace, Peace Crane. 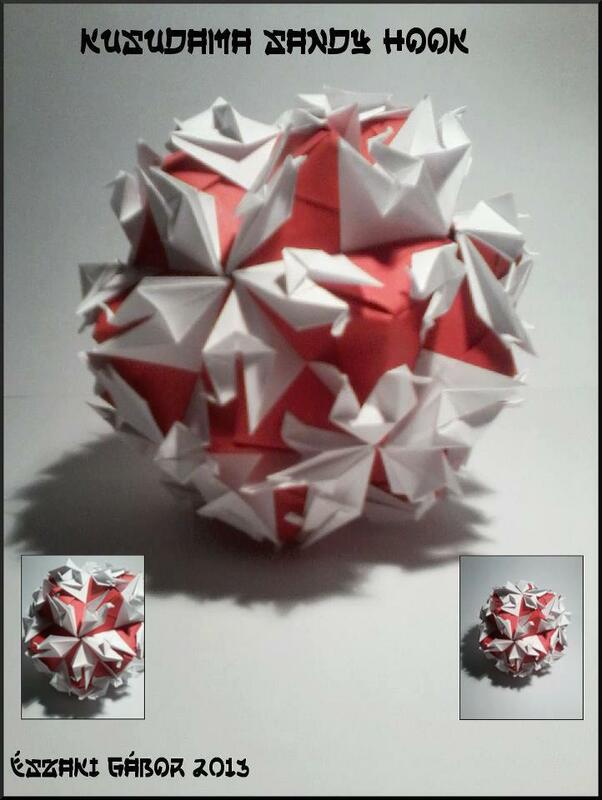 This is a new Kusudama design, “Kusudama Sandy Hook,” featuring peace cranes. I am looking forward to finding the folding instructions for this wonderful tribute to the Sandy Hook community! This entry was posted in Art, Math, Origami, Sandy Hook, Science, STEM and tagged art, Calista Frederick, Calista Frederick-Jaskiewicz, Gabor Eszaki, Hungarian Origami Society, Hungary, Kusudama, Operation Sandy Hook, Origami, Origami Salami, Peace, Peace Crane, Sandy Hook.